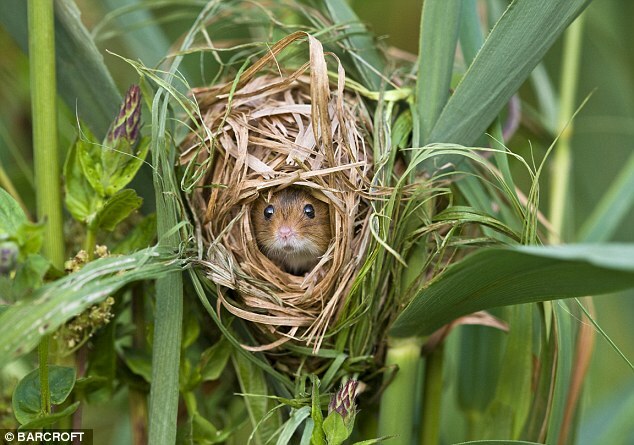 A stunning and rare insight into the secret tiny lives of adorable harvest mice is revealed in incredible pictures captured painstakingly over 12 months. Photographers Jean-Louis Klein and Marie-Luce Hubert, both from the Alsace, France, spent the year snapping the furry subjects in a project that ended with their release into the wild. Laying patiently in meadows and reed beds, the pair were able to capture the fascinating images. One shows a mouse being suspended in the air on the tails of his fellow critters. 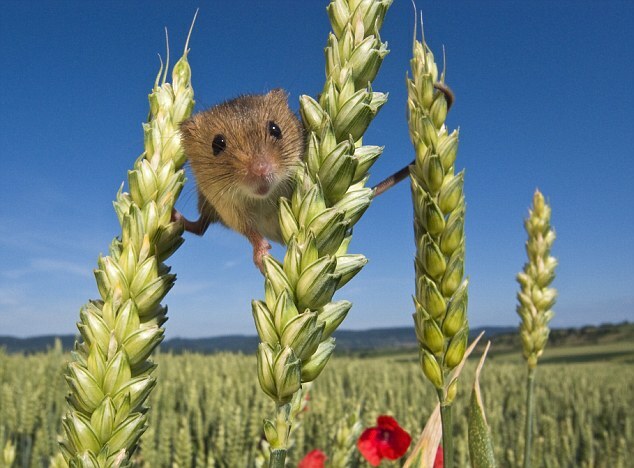 Another curious mouse was spotted inspecting a camera while balanced precariously between two sheaves of wheat. From the studio – where the pair documented tiny newborns and their first few weeks of life – to the great outdoors where all of the 30 mice were eventually released, the pictures take viewers through almost every event they faced. Also captured are stunning underwater pictures of one of the animals swimming. 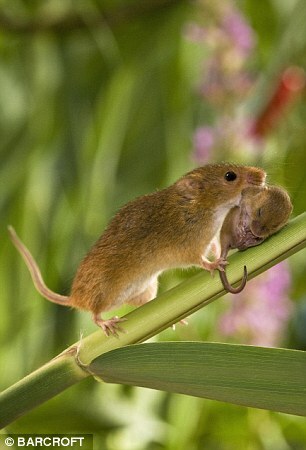 Other behaviour documented in the captivating series were fighting, nest-building, foraging, balancing and even a mother mouse carefully rolling one of her babies along a tiny branch. 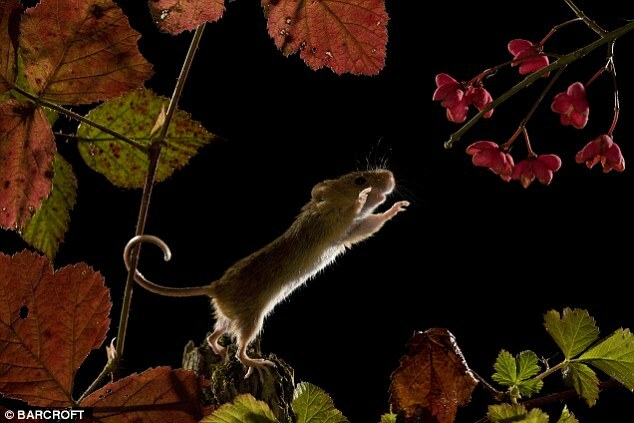 Jean-Louis said: ‘All of the harvest mice came originally from captivity and were eventually released into a field where we continued to photograph them, always carefully choosing a suitable habitat where we knew they could survive. ‘We also wanted to show the behaviour of the animals during maternity, but we wouldn’t have been able to get this in the wild without disturbing the mother and there was a danger a wild mother might have abandoned them. 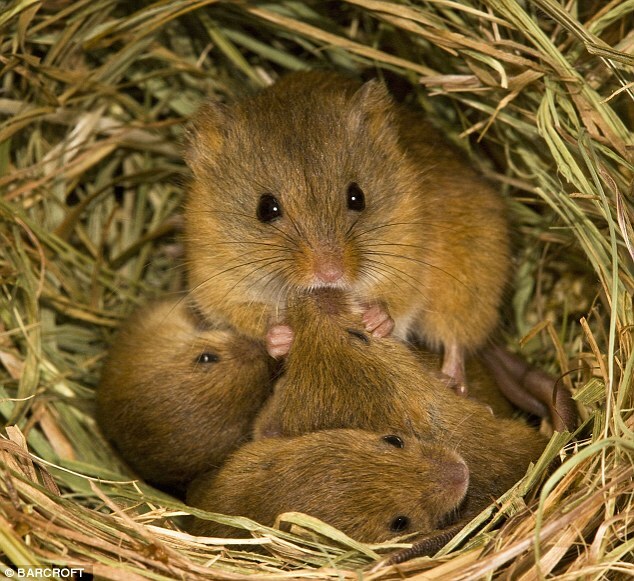 ‘Instead we shot the maternal behaviour in a studio before releasing the mice once the babies were mature enough for the wild. The incredible patience of Jean-Louis and Marie-Luce, which sometimes saw them frozen in position for up to four agonising hours, paid off by allowing them to witness some amazing moments rarely seen by humans. 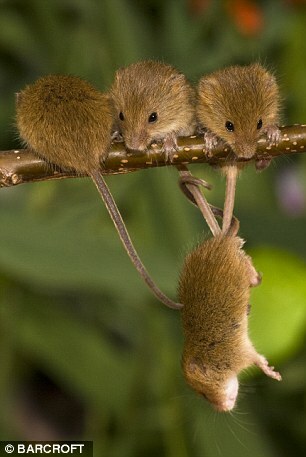 One such moment saw an adventurous young mouse getting into an unusual position – hanging from the tails of three of its siblings. 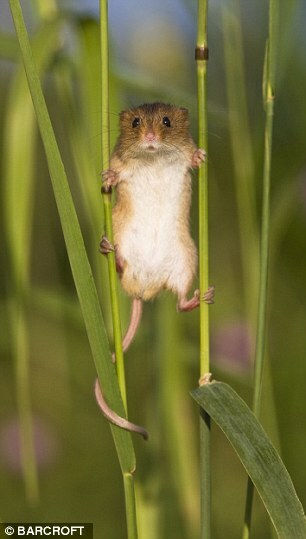 ‘These were young mice becoming independent and playing not far away from their nest,’ said Jean-Louis. ‘After the mother leaves, the young remain together for a few days while they grow in confidence and then disperse. 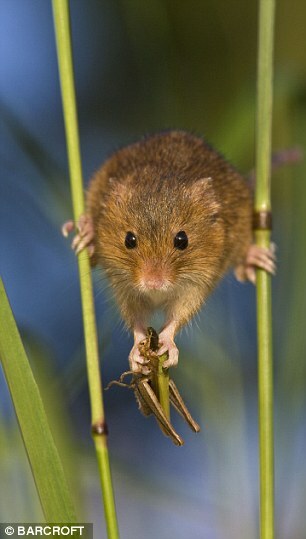 ‘Like a monkey, the harvest mouse has a prehensile tail, using it as a fifth leg. 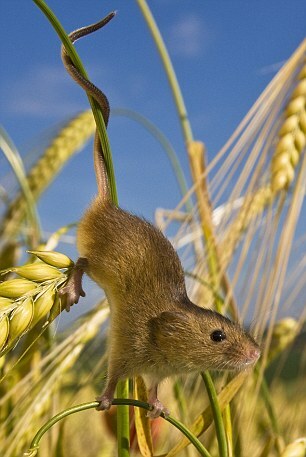 The tail is mainly used to keep balance while climbing among grass stems. That way, the mouse is free to use both his hands. The project was the culmination of 20 years of fascination of the animals for Jean-Louis and Marie-Luce. 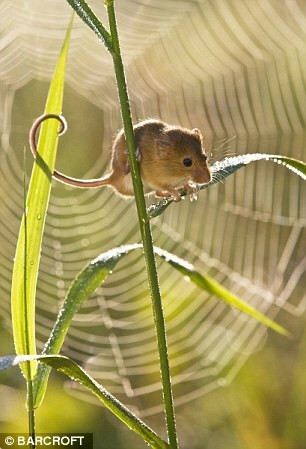 Marie-Luce said: ‘Two decades ago we saw our first harvest mice in a huge vivarium in a wildlife sanctuary. We were absolutely fascinated by their little acrobats and we hoped to find time one day to learn more about their behaviour in the wild. ‘We were very happy to finally complete this project last year in an effort to document all the ways that they behave.